"Nothing But a Heartache" is one of my all time favorite songs. It combines many things I love: retro soul, girl group music, and a melody that is catchy and dynamic. The Flirtations recorded this song in 1968, and it was a hit for the group, making the Hot 100 list. The Flirtations started recording in 1962 as the Gypsies. Two of the singers were sisters from South Carolina. They were marketed as being like the Supremes, and there are some real similarities in sound and performance style. "Nothing But a Heartache" became a Northern Soul hit. Northern Soul music was soul music that achieved popularity in dance clubs in Northern England, Scotland, and Wales in the mid-1960's. Northern Soul songs were typically by less well known artists. They were uptempo with a good beat for dancing. I have loved this song for years. I have it on my Blackberry, my iPad ... and now I am happy to share it with you, too. What an awesome blast from the past! Thanks for sharing! 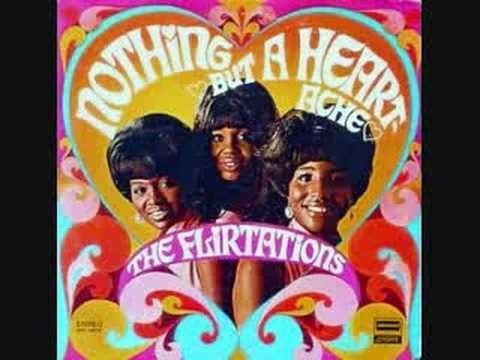 I'm not familiar with 'The Flirtations' but I enjoyed this song. I love most of the 60's music and fashion too. Love those bell bottoms! Thanks for the memories. Great song! One question - how do singers from Soutj Carolina end up hits in the northern UK? Was there a record label that was looking for people to promote there? Shay - that is neat that you have a memory of the song. I never heard it until about 10 years or so ago ... and haved liked it ever since. Dave - Northern Soul music was soul music that was promoted by DJs in Northern England, Scotland and Wales. The DJs loved lesser known soul artists, songs, and smaller labels. A song like this (not as big a hit as the Supremes music) would have been exactly what they were looking for to play in clubs.